A day in the blazing heat riding along the exposed top of the dam that holds The Rhine into a navigable river, its all very reminiscent of fenland rivers, alongside the main river are poulders which are flooded when the water flow is to high for the river. The German’s struggle with the signing so that in the main centres like Kehl (Strasbourg) you get a proliferation of contradicting signs! 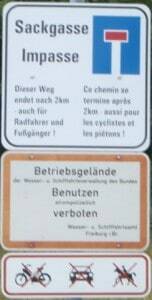 I also love the sign covered in German & French text that forbids entry but fails to give you any information as to where the route has been diverted too! These guys need lessons in the use of simple signage like the Swiss and French GR5. Oh yes why do German hotels only have wired internet 🙁 and all WiFi is locked down? and why can’t T-Mobile sort out my internet – instead of sending me messages that an error occurred and try again 🙁 To me its pretty obvious the glorious days of open internet have gone for ever.. I hope you avoided Strasburg.On the bike coming back last week I got routed through its main roads, snarled up with huge trucks. It was hot and ghastly. Hopefully on a bicycle you can completely avoid that. Keep going and don't panic, don't panic!